It’s not unusual to see some big changes between an older and newer generation of the same model, but this all-new Peugeot 3008 SUV looks radically different to the outgoing model. That exiting generation – confusingly introduced in 2008 – was a frumpy, chubby looking SUV that did little to inspire buyers. The all-new Peugeot 3008 SUV, though, is a completely different animal, burying the clumsy image of the last car six-feet under and achieving the European Car of the Year crown. How does the Peugeot 3008 SUV perform? Sometimes it can be tricky to separate SUVs out on the road because most of them drive quite similarly. Many are set up for comfort, and that’s what the all-new 3008 SUV is tuned for. The small steering wheel and the light steering gives a feeling of nimbleness, even if that’s perhaps not the case as it is a tall sided and heavy car. However; that’s not a complaint, the designers and engineers have done a good job covering the traditional flaws of an SUV’s dynamics. Responsive and comfortable with the petrol engines and a manual gearbox, throttle response in the optional automatic gearbox can be lessened as the transmission takes a second to work out what it needs to do. It’s no big deal as it only really shows up when you plant your right foot down, but it could hinder overtaking. There’s a decent selection of engines on offer, as with most Peugeot models: two petrols in the shape of a 130PS 1.2-litre unit and a 165PS 1.6-litre turbo. Then there are a couple of turbo diesel engines of 1.6-litre and 2.0-litre capacity. The oil-burners come in different strengths, with the lower capacity diesel coming with 100 or 120PS, and the larger 2.0-litre coming with 150PS or 180PS. What suits you best is largely going to depend on what sort of driving you do. Short urban trips suit the 1.2-litre petrol more, whereas longer journeys will fit the potential 70mpg obtainable from the 1.6-litre diesel. Gone – thankfully – is the uninspiring and unattractive styling of the last generation, to be replaced by a stunning new luxury SUV image. This fresh look has catapulted the all-new Peugeot 3008 straight to the top of the tree when it comes to desirability. And there are wonderful design touches all over the car that make it really stand out – especially around the headlights and with the floating roof effect in profile on the car. If the exterior impresses you, the interior might just blow you away. The overall quality and design leave you seriously questioning if this really is a Peugeot. It’s a rather shocking experience; a Peugeot interior might never have been this good. French designers may have always had flair, but they’ve traditionally had trouble putting it to use. However, they’ve absolutely nailed the design of the all-new 3008 SUV, that’s for sure. Peugeots in the noughties may have suffered from a lack of overall build quality, but the brand is looking to improve upon its previous failings. And from spending some time with the all-new 3008 SUV, we can’t see anything that we’re overly concerned about. Time will be the judge of course, but it looks like the all-new Peugeot 3008 SUV will hold up quite well. 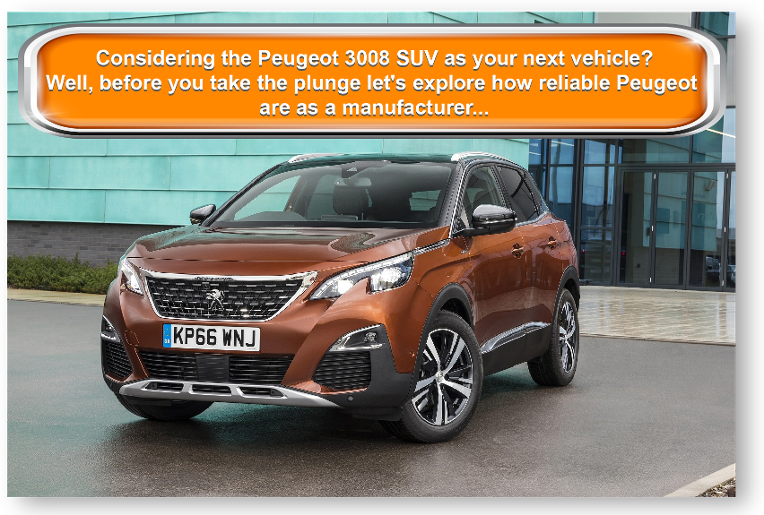 Technology is a vital part of any new car, and for all the all-new Peugeot 3008 SUV’s fancy design, it won’t mean a thing unless it can back it up with decent garnishes of tech. Luckily it does, and the ‘i-Cockpit’ is the most obvious place to start, as that affects the architecture of the overall cabin design. You get a low-set small steering wheel and highly placed digital dials and readouts in the upper dash, supposedly giving a more relaxed driving position. 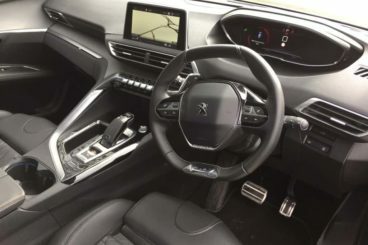 In the centre of the dash, there’s a touchscreen system and although it isn’t instantly easy to navigate, it looks pretty and is easy enough to get used to. Underneath, are toggle switches for various functions, too, but many control mechanisms are deep inside the menus of the infotainment system.Only the entry-level Active model doesn’t get satellite navigation, but you can use your smartphone with Apple CarPlay or the Mirrorlink system. Aside from that, all variants are nicely equipped with climate control, cruise control, DAB radio, and automatic emergency braking. The i-Cockpit is standard, but for parking sensors and a reversing camera, you’d have to start from the ‘Active+’ trim level. The all-new Peugeot 3008 SUV starts at £21,795 and can hit £32,995 in top-spec ‘GT’ trim, as tested in our video. The best bet would be to aim for ‘Allure’ or ‘GT-Line’ mid-spec versions, as these give the best value. £26,845 is the list price for our pick – a 1.6-litre 120PS diesel-powered ‘Allure’ spec model with an automatic gearbox, though you should expect a discount on that list price. We always have a little look around the lease market for you and we’ve managed to find some 1.6-litre 120PS diesel ‘Allure’ models for around £250 a month, with six to nine months paid in advance – and that was for personal use customers, too. 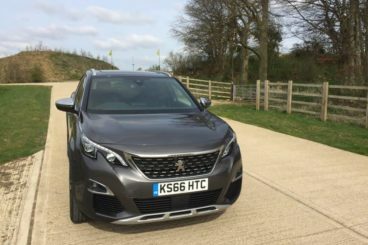 Business customers can get the same model for around £210 a month, which is good value as the all-new Peugeot 3008 SUV has strong standard specifications. Peugeot’s designers have gone to town with the all-new 3008 SUV, creating an incredibly stylish family vehicle that just oozes motor show chic. It looks like a concept car still, and not many machines make it to the market retaining that fresh and distinctive futuristic look. Excellent stuff, Peugeot! With the outside looking so inspiring, the inside really needed to back up the perception the new Peugeot 3008 was trying to broker. Thankfully, the Peugeot designers nailed the interior space, too, designing another conceptual space that has that ‘wow’ factor – something incredibly rare in SUVs. They were backed up by the engineers who produced some fine materials to fit as well, so it feels as special as it looks. Away from the drama and edginess of the design, there’s good news to report on the practicality front. There’s plenty of head and knee room for passengers, wide opening doors, and an impressive 591-litres of load space in the boot. This balloons to 1,670-litres when the seats are folded down. You might want to avoid the entry-level trim ‘Active’, but at the same time, you’ll probably want to dodge spending almost £33,000 on the top-spec ‘GT’ as seen in our video. It’s a huge amount of money for a small SUV. Your best bet is to aim in the middle of the trim levels and get a good finance deal – there are some good ones out there. It’s tricky this because we’re not talking about a car that needs to have sports car performance here. However, the 100PS output from the base 1.6-litre ‘Active’ diesel feels underpowered, so make sure you go for the nippier 120PS unit. The petrol engines on offer all feel sprightly, so it’s only really that lower powered oil-burner that you’re best walking by. The ‘i-cockpit’ is built around a philosophy of giving the driver a more stress-free driving position, but the low-mounted smaller steering wheel might cause trouble for taller people over 6ft tall. This is because it can invade knee space a little. The only way you’ll know is to try it and see for yourself. The Seat Ateca has come along recently and has impressed the market with its attractive styling and fun handling. It’ll make the all-new Peugeot 3008’s life a bit difficult, that’s for sure – as will the 3008’s French cousin, the Renault Kadjar. The Kadjar is another Gallic attempt at an SUV that also has some impressive looks. VW Group – the owners of Seat, Audi, Skoda, and more – have been very clever in introducing the new Seat Ateca to the market. In many ways, it is identical to the Volkswagen Tiguan, sharing parts and features, yet VW, as a brand, has become more premium in the last decade or so. Therefore, Seat has come out with the Ateca to reel in sales at a slightly lower price point. The question then is – why bother with a Tiguan? Well, you shouldn’t unless you’re a massive badge-snob because the Seat Ateca is a cracking little SUV that is essentially a VW Tiguan with more style and a cheaper price-tag. The quality is the same, with a very well built and finished interior space and almost identical engineering. The biggest difference in our comparison between the Seat Ateca and the all-new Peugeot 3008 SUV is the way they drive. The Ateca feels much sportier – yes, that is possible in an SUV! It also has a firmer, less comfortable ride but with the benefit of managing corners and handling a more aggressive driving style. We’re just not all that convinced that this is exactly what a small SUV needs, though, as nine times out of ten we’re not going to be thrashing our SUVs around at breakneck pace. Practically speaking, there’s plenty of room in the new Seat Ateca with 510-litres of boot space, but it doesn’t match the all-new Peugeot 3008’s 591-litres, and that extra room could prove valuable to some. The Ateca does at least make up for slightly less space by being cheaper to buy, though. It starts at just over £18,000, more than £3,000 less than the Peugeot, though whether anyone will go this low in the range is questionable. Peugeot 3008 SUV – £21,795 to £32,995. 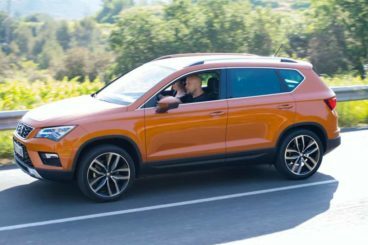 Seat Ateca – £18,150 to £30,595. A French-on-French SUV rumble is a remarkably one-sided affair in favour of the all-new Peugeot 3008. While both cars are stylish in their own way, there’s no doubting that the all-new Peugeot 3008 SUV looks far more futuristic than the Renault Kadjar and, overall, it feels far more up to date. It’s like the all-new Peugeot 3008 has been designed looking forwards, with the new vision of what an SUV should be, whereas the Renault Kadjar has been designed using the old rules. The Kadjar is far from being a bad car, though, with that strong styling, solid – if unspectacular – interior quality, good diesel engines, and useful storage space – despite it having the lowest boot capacity, at 472-litres here. Its biggest flaw is its automatic gearbox, a unit that feels permanently uncertain about what it really wants to do. And that can prove to be a bit of a pain in the backside when it comes to driving around town or overtaking. That said, when up to speed and cruising along it covers ground very nicely indeed – and is well capable of scoring over 60mpg on a run with the 1.6-litre turbo diesel engine. It rides nicely but can be a little crashy over particularly harsh surfaces, although that’s not uncommon in cars with soft suspension. 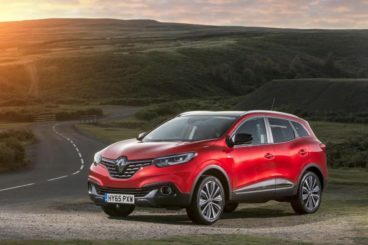 Renault Kadjar – £20,845 to £26,665. There can be no doubt about the winner here – it’s the all-new Peugeot 3008 SUV. While its rivals each offer their own thing, and for the most part play their roles very well, the all-new Peugeot 3008 SUV is now miles ahead of the competition with gorgeous styling, huge interior quality and economical engines. If that isn’t enough, it has the most space, too. You could be driving away with your new car in no time. Fill in your details below and one of our vehicle experts will be in touch within 48 hours to talk you through the leasing process.